Reviews for "FROM TENNESSEE TO OZ"
FROM TENNESSEE TO OZ, Part 1 is the amazing saga of Judy Garland's family history. Beginning with the pioneers, travel with this family through eighty years of American history. Book includes over 100 pages of Civil War, both on the battlefield and homefront. (1793-1870) This book lays the foundation for Part 2. 267 pages, index, bibliography, fully footnoted, 50 images, including maps and rare family photos. 5 Family trees. (Please allow 2-3 weeks for delivery.) Price button includes book and postage. From Tennessee to Oz - Part 2 Pre-Release copies available NOW! Will and Clemme, begins with the marriage of Will and Clemmie Gum- the grandparents of Judy Garland. This joyous beginning soon takes on a dark, suspenseful and sometimes frightening mystery. Extensive court papers have allowed the story to be told in (close to) novel form. Young Frank Gumm is a story that covers far more than any book has yet to reveal. From a childhood of deprivation, Frank is sent to what was considered the best school of the south, Sewanee, where he is also given some of the finest musical training. Young Gumm travels the country, singing. His life remains closely connected to that of his brothers and sisters as well as other relatives. It is an exciting and surprising early beginning. Those Gumm Girls is the story of Mary Jane, Dorothy Virginia and Frances Ethel Gumm. The reader will find many funny stories about the Gumm girls and their adventures. Because her friendship with many persons who knew the Gumm family, author Michelle Russell has preserved their memories and gives us a view of the Gumm family from the inside. You will laugh and cry, but this is a story you won't forget. Part 2 comes full circle when young Judy Garland, now a star, travels across the country, entertaining the WWII troops and reunites with her Tennessee relatives. This book is truly an amazing history of America and one family who gave birth to the most unforgettable entertainer of our time. 518 pages, over 170 images FREE POSTAGE when you Buy It Now! "Musical Memories - Vaudevile Songs" is a CD produced by Michelle Russell. 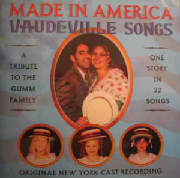 The upgraded version contains 21 songs the Gumms sang with the cast that performed this tribute in NYC. Appearing on the upgraded version on Brian De Lorenzo, Jennifer Ackerman, Laura Oseland, Ashley Birmingham and Sofie Zamchick as Baby Gumm. Musical direction by Mark Hartman and Sue Maskaleris. Additional songs have been added to this version along with violin, ukulele and clarinet.